Macro and miofloral analyses of coal-bearing sequences of the Jarangdih coal mine, Damodar Basin, were carried out to infer the floral diversity, age assessment, and the palaeoenvironment during the deposition of the Barakar Formation in this area. Damodar Basin, one of the five major Gondwana basins in India, is considered as the reference basin for inter-basinal age correlations. The Barakar strata of this colliery have yielded a diverse macroflora consisting of the groups Glossopteridales (Glossopteris, Vertebraria, Gangamopteris, fructifications, and stem casts) and Equisetales (Phyllotheca indica, Schizoneura gondwanensis, and Paracalamites sp.). The genus Glossopteris dominates the assemblage with 16 species viz. G. arberi, G. communis, G. churiensis, G. giridihensis, G. indica, G. intermedia, G. intermittens, G. leptoneura, G. linearis, G. mohudaensis, G. recurva, G. searsolensis, G. stenoneura, G. taenensis, G. tenuifolia, and G. tenuinervis. The leaves of Glossopteris leptoneura have impressions of male sporangia adhered on them. The groups Lycopodiales, Coniferales, Sphenophyllales, and Filicales are not represented as macrofloral remains; however, their presence is recorded in the palynoassemblage. The palynological analysis has revealed only one palynoassemblage characterised by the dominance of striate bisaccate palynomorphs mainly Faunipollenites and non-striate bisaccate pollen—Scheuringipollenites. The other stratigraphically significant palynotaxa are Striatopodocarpites, Verticipollenites, Crescentipollenites, Striatites, and Arcuatipollenites. The recovered palyno- and megafloral assemblages suggest the late early Permian (Kungurian) age to the Barakar strata of Jarangdih coal mine and prevalence of moderately warm climate during their deposition. The authors are thankful to Director, BSIP for granting permission (BSIP/RDCC/93/2017-18) and providing necessary facilities to carry out this work. We are grateful to the reviewers Dr. Zbyněk Šimůnek, and Prof. Shreerup Goswami for their fruitful comments and suggestions that have helped us to improve the manuscript. We also acknowledge Dr. Christopher J. Cleal, National Museum Wales, Cardiff, UK, for his critical comments and linguistic improvements. Saxena, A., Singh, K. J., Cleal, C. J., Chandra, S., Goswami, S., & Shabbar, H. (2018). 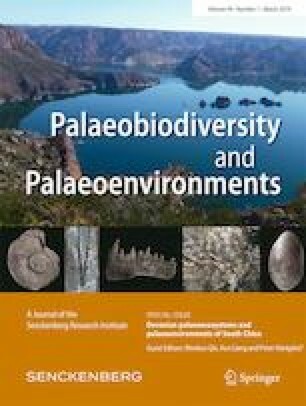 Development of the Glossopteris flora and its end Permian demise in the Tatapani–Ramkola Coalfield, Son–Mahanadi Basin, India. Geological Journal. https://doi.org/10.1002/gj.3307.